Oops - we don't appear to have a video for the DocuMate 3120. The Xerox® DocuMate® 3120 color sheetfed scanner takes your documents, credit cards, ID cards and forms and files them securely on your computer or in the cloud readily accessible when you need them. It can scan up to 40 images per minute (ipm) in duplex and includes a 50-page Automatic Document Feeder (ADF) to handle anything from business cards to A4 documents. With a small footprint, the DocuMate 3120 fits comfortably on any desk (especially when folded closed), making it the perfect solution for any business that desires to quickly convert paper documents into searchable PDF files that to be easily shared, organized and protected. Powered by Visioneer OneTouch® technology, the scanner allows users to scan to the “destination” of their choice by pressing a single button, eliminating multiple steps usually required to save scanned documents in popular file formats. Visioneer OneTouch allows you to scan documents to your choice of 9 preset yet completely user configurable destinations. This enables your documents to be scanned with the correct settings for resolution, color, cropping, file format and then delivered to virtually any application, folder or device – all at the touch of a button. 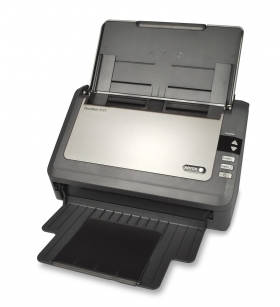 The DocuMate 3120 produces clear and sharp scans of any document, in color or black and white. Worried that your highlighted notes from the meeting won’t scan clearly? What about the receipt that was folded in your pocket? Real world documents are never a problem for the DocuMate 3120. Visioneer Acuity technology enables the scanner to instantly improve the visual clarity of every scanned image. You get perfect scans from imperfect originals.